This blog describes my experiences with the MS Dynamics AX. Following job can be used to import multiple label files from a folder. The label files are not automatically saved in AOT so a manual Save all is required. This posting is provided "AS IS" with no warranties. Use code at your own risk. Cannot read a record in AifResponse (AifResponse). The corresponding AOS validation failed. Cannot create a record in Gateway queue (AifGatewayQueue). User 'BatchUser' is not authorized to update a record in table 'SYSWORKFLOWTABLE'. Request denied. Cannot edit a record in SysWorkflowTable (SysWorkflowTable). Access Denied: You do not have sufficient authorization to modify data in database. The error message showed that user does not have access to the tables. However even granting System Administrator was not fixing the issue. The only workaround we could find was to deactivate an AIF port. This somehow fixed the issue. We opened a case with Microsoft and solution provided by MS engineer was to make sure that the SID in the following registry key was that of the account running AOS service. In our case the SID was that of the user who installed the AOS on these machines. After changing the registry key on all AOS (while the AOS service was not running), the error disappeared. Please take a backup before modifying registry. While working on AX integration using BizTalk, a requirement arose to save some of the configuration data. There are several options available as described in this article. We decided to store the configuration in the SSO database. 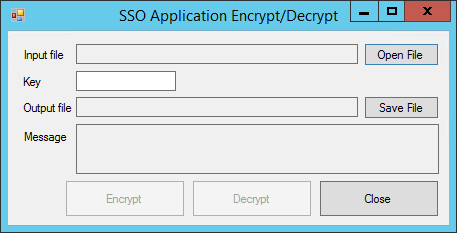 While the MMC snap-in provided by Microsoft is good enough, there is no option to bulk edit the Key/Value pairs stored in the SSO database. The snap-in does allow to export the file, but its encrypted and hence cannot be edited outside of the snap-in. We wrote a small utility which allows to decrypt/encrypt the files exportable from the snap-in. Once exported, the file can be decrypted, edited in a text editor, encrypted again and can be imported in the snap-in to create the key/value pairs in the SSO database. The utility can be downloaded from here. Recently we had to create a plan guide in SQL Server (not a good long term solution). Everything seemed to be working fine until we had a production deployment and the database synchronization failed as shown in the screenshot below. It seems that during synchronization a store procedure is recreated. As our plan guide was based on queries in the stored procedure, AX was unable to drop it. Only solution was to drop the plan guide (disabling the plan guide did not help) and re-create it after the synchronization.